When the Blues bowed out of the playoffs rather meekly, we all knew there would be consequences. Coach Ken Hitchcock survived that failure, but change was inevitable for the roster. T.J. Oshie became the latest and most notable veteran to exit, departing to the Washington Capitals in a trade designed to expedite the evolution of the team nucleus towards new leaders. His underwhelming playoff performance against the Minnesota Wild made him an obvious mark for Blues general manager Doug Armstrong, who sought to freshen up his roster after watching the squad go stale. He hoped to create an opportunity for energetic prospect Robby Fabbri, who made a huge impression in last autumn's training camp. The Oshie move finally came in a trade with the Washington Capitals Thursday. But the return of Troy Brouwer, goaltending prospect Phoenix Copley and a third-round pick isn't overwhelming. Perhaps some fans flashed back the Rod Brind'Amour deal, which fetched Ron Sutter and Murray Baron. But this is different. Oshie plateaued here at a good-but-not great level. Brouwer is a three-time 20-goal scorer who figures to bang around in a third-line role. He should play sturdier hockey than the recent vintage Oshie, who hasn't played with his same youthful abandon after suffering a series of injuries stunted his development. Brouwer will add some heft up front and give the team a little different look. He can take faceoffs and check. He plays a straight line game and uses his size along the wall and in front of the net. But Brouwer was a non-factor for Washington in the most recent playoffs, producing no goals, three assists and a minus-3 rating in 14 games for the Capitals while playing almost 18 minutes per game. He will count $3.75 million against the salary cap next season and then become an unrestricted free agent, which is notable for a team trying to clear long-term salary cap flexibility to accommodate a new contracts for Vladimir Tarasenko and Jaden Schwartz -- who supplanted Oshie as a franchise cornerstone. As for Oshie, he gets a fresh start. Moving from the Blues to the Washington Capitals is about as good as it gets under the circumstances. He and former Los Angeles Kings winger Justin Williams come aboard to add depth to an offense disproportionately relying on Alexander Ovechkin and Nicklas Backstrom. They should help bring along emerging forward Evgeny Kuznetsov while also giving the power play different looks. Oshie escapes St. Louis, where he was at once a fresh-faced fan favorite and source of frustration for those expecting him to become a star. Oshie topped 20 goals just once while wearing the Note. 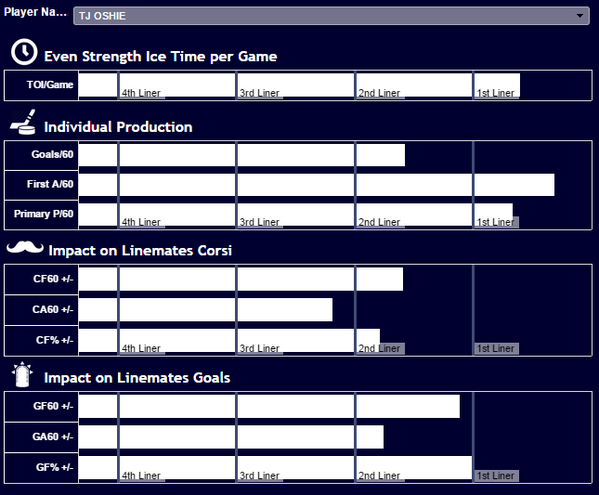 Not feeling how many appear down on Troy Brouwer in the T.J. Oshie deal. Can score, physical, durable. West will be war of attrition. Brouwer: "I'm an honest player, a guy that works hard. I can make some plays ... but I'm a big-bodied forward, get into the corners." Army: We're still active in maybe looking to add another piece or two. But they're not a higher level. This solidifies group of 9 forwards. That Oshie deal for Washington is awesome for the Caps. Gonna be fun times in D.C.
As I wrote: Oshie + Williams >>>>>> Ward and Brouwer. Great work from MacLellan this summer so far.